After the conference agenda Please type on the picture - EDITOR [[underline]]EDITORS NOTE[[end underline]] PICTURE GOES ON TOP first, then the article. 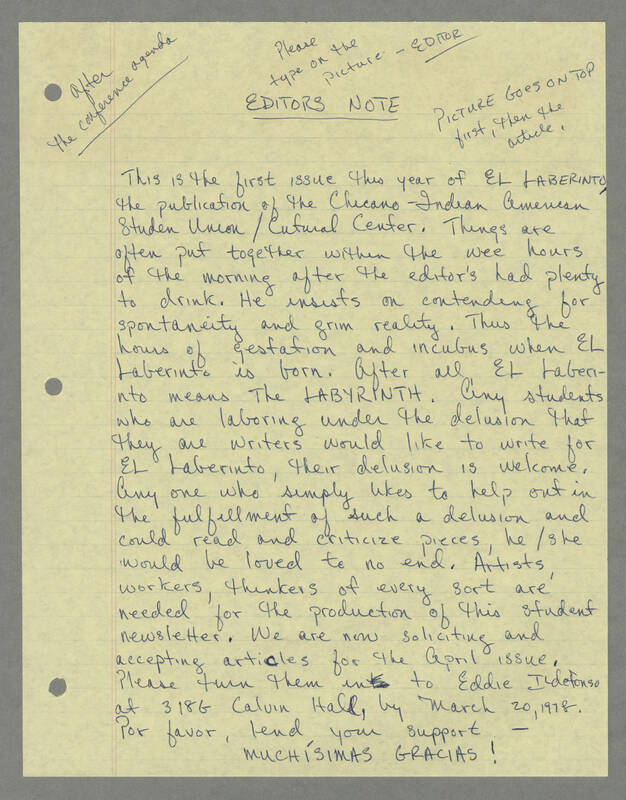 This is the first issue this year of EL LABERINTO, the publication of the Chicano-Indian American Student Union/Cultural Center. Things are often put together within the wee hours of the morning after the editor's had plenty to drink. He insists on contending for spontaneity and grim reality. Thus the hours of gestation and incubus when EL Laberinto is born. After all EL Laberinto means The LABYRINTH. Any students who are laboring under the delusion that they are writers would like to write for EL Laberinto, their delusion is welcome. Any one who simply likes to help out in the fulfillment of such a delusion and could read and criticize pieces, he/she would be loved to no end. Artists, workers, thinkers of every sort are needed for the production of this student newsletter. We are now soliciting and accepting articles for the April issue. Please turn them in to Eddie Ildefonso at 318G Calvin Hall, by Marc 20, 1978. Por favor, lend your support - MUCHISMAS GRACIAS!